Pacific Sun Taekwondo – Self Defense. Discipline. Fitness. Fun. 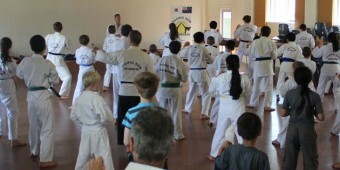 Learn traditional Taekwondo from expert Instructors at branches throughout New Zealand. Our classes and philosophy differ from some other martial arts schools. At Pacific Sun Taekwondo, we focus on your individual progress and achievements while helping you attain your training goals. So whether you want to improve your health, fitness and well being or go all the way to Black Belt and beyond, we’re here to help you. You’ll learn how to kick, punch, block and jump, and you’ll be graded and assessed regularly so you know you’re progressing as you achieve each new belt level. You’ll develop life changing skills including discipline, perseverance and determination, but the greatest benefit you will achieve is the self belief that you can do anything when you know how to go for it! Under the watchful eye of Master Trevor Dicks (8th degree Black Belt), Pacific Sun Taekwondo’s reputation for excellent teaching, amazing results and commitment to its students remains unchanged after almost years in martial arts. Contact your nearest branch now so you can begin your free introductory lessons with Pacific Sun Taekwondo!